On September 3rd, E.S.P. TV will present The Shop / Poet Transmit as the concluding event to official office. official office is the most recent installment of Recess’s online residency, Analog, which provides sustained, virtual space for rigorous contemporary projects that challenge traditional presentation. From 12-6pm, the artists will transform Recess into The Shop, an extension of artist and writer Cat Tyc’s multimedia project, Consumes Me. Full clothing racks will be installed inside Recess. Visitors will be welcome to take articles of clothing in exchange for one of their own, composing a text about a piece a clothing, recounting a memory of a beloved article of clothing, or reciting an excerpt of Tyc’s text which focuses on the invisible labor of clothing production. Live footage collected by Anna Troupe of clothing manufacturers at work in a 24-hour plant in Bangladesh will be projected inside The Shop. The live broadcast feed will be operated by E.S.P. TV from their mobile television van parked outside Recess. From 6-8pm, Recess will become the site for Poet Transmit. 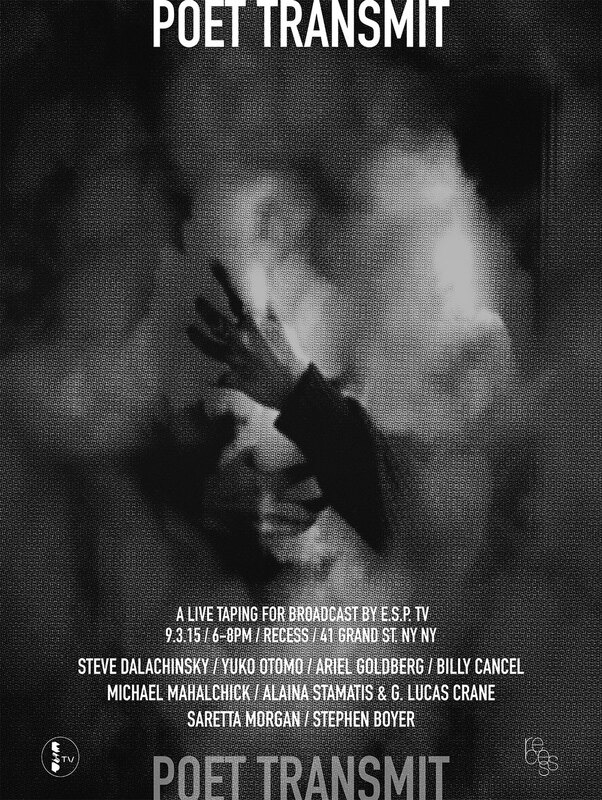 Continuing the connections between broadcast, memory and object initiated by The Store, the evening will segue into a series of live readings and performances. E.S.P. TV will live mix, manipulate and broadcast these performances both within the space and to the other participating Official Office spaces located around the world. Participating artists include Steve Dalachinsky, Yuko Otomo, Billy Cancel, Saretta Morgan, Ariel Goldberg, Stephen Boyer, Michael Mahalchick, Alaina Stamatis and G. Lucas Crane and many more. Poet Transmit is a nod to Soho’s historic role as nexus of artists like Nam June Paik, Ira Schneider, and Frank Gillette, who engaged in transmission as a way to complicate the relationship between subject, spectator, and television. Cat Tyc is an artist/writer/filmmaker based in Brooklyn, NY. Her music videos have aired on LOGO’s NewNowNext as well as MTVu. In 2006, she was a fellow at the Flaherty Seminar “Creative Demolition: Reconstructing Culture through Innovations in Film & Video” at Vassar College. She is a member of New York Women in Film and Television as well as the Brooklyn Filmmakers’ Collective. Most recently, her poetry & fiction have been published 6x6 and Weekday and she is currently an MFA Candidate at Pratt Institute for Writing & Activism. Her videos have also screened at the CUNY Graduate Center & Anthology Film Archive (NY), Microscope Gallery (Brooklyn), Vox Populi (Philadelphia), Kings ARI (Melbourne), MMX Open Art (Berlin), PDX Fest (Portland, OR) & the Camac Centre d’Art (Paris) and the Brooklyn Museum. Anna Troupe is a designer, researcher, and social entrepreneur working to improve the sustainability and humanity of the readymade garments (RMG) industry. Based in Dhaka, Bangladesh, her program, ReadyTogether, a social enterprise, focuses on improving gender equality as a first step to sustainability by creating career paths for women in RMG. In Jaipur, India she leads a home-sewing model called Hunar Revolution to build skills and economic empowerment among impoverished women. Both efforts seek to bridge higher education (locally and abroad) with key development partners and industry to comprehensively address the production challenges facing the global fashion complex. Anna was first connected to Bangladesh through a fabric design competition created to support the rural Sirajganj weaving communities and preserve their traditional craft. Her winning entry became the flagship pattern for Grameen Check in 2011 and was made into clothing and home goods in Japan by the philanthropic design firm, Felissimo. This project went on to support the sale of bicycle-powered water filters and creation of water businesses in rural Bangladesh by Japanese firm, Nippon Basic. In 2013, she consulted with Nobel Laureate Muhammad Yunus on the plight of garment workers, and completed her MSc at NCSU College of Textiles in 2014 before relocating to Dhaka.